Condensation is a common problem with refrigerators. It happen when the warm air around your fridge cools causing a layer of water or a small puddle of water to form. Condensation can make the area around your fridge wet damaging wall and floors. It can also encourage mold growth. It’s best to solve the problem of fridge condensation as soon as possible to prevent any damage. The most common reason for excessive fridge condensation is a door gasket that isn’t properly sealing. The gasket is what causes the air tight seal between your fridge and you community. When that fails, you get condensation forming. Before assuming that a bigger fix is needed to fix a refrigerator condensation problem, eliminate a few other potential causes for the condensation. Changing the temperature settings in your refrigerator can increase condensation. If you’ve recently adjusted the temperature, try putting it back to the temperature it was originally. Wait to see what happens. Hot foods can also adjust your fridge temperature enough to cause condensation. Leaving the fridge open for a period of time can cause a significant change in temperatures which would cause condensation as well, so be sure to always make sure your fridge is completely closed. Humidity can cause condensation. If it’s humid where you live, those already high levels of moisture in the air can also be responsible for causing condensation. A broken or worn out refrigerator gasket or seal can be responsible for causing condensation. The gasket is responsible for sealing the fridge properly closed meaning that it works by keeping the cold air in and preventing the warm air from getting into your fridge. If you suspect this is the problem, replace the seal. This can be done yourself, although it requires more work. Double check the do it yourself-er version by doing the dollar test. Place a paper bill in between the door. The seal should be tight enough so that the bill can’t be easily pulled out. It’s important to make sure your fridge is properly leveled. This is something many people forget about and it can be the cause condensation and the collection of excess moisture. When the fridge isn’t balanced and leveled, water won’t flow down the drain the way it should. Most floors are uneven. This is true, even if at the first glance, the floor looks level. Usually there are some sorts of dips. Simply use a level and the leveling leg and adjust the leg until the level shows that everything is as it should be. If the leveling leg is missing or broken, you can buy another leg. Or you can use paper or cardboard to level the fridge. When the fridge is leveled, it cools off better. The moisture that often collects in a refrigerator can make your fridge smell as the bacteria begins to grown. It’s important to give your fridge a chance to drain any excess water. 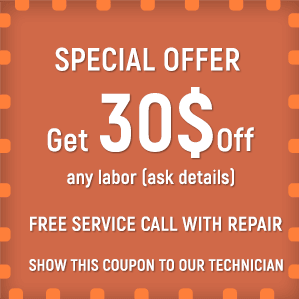 If you cannot do it on your own, it is best to call in the appliance repair experts in San Diego county.